The Exeter Analytical Model 440 CHN microanalysis instrument can easily determine the percentage Carbon, Hydrogen & Nitrogen in liquid samples. Volatile liquids can be routinely analyzed without sacrificing accuracy or precision. Exeter Analytical Inc. has produced an application note that describes how a proprietary liquid sample preparation technique together with controlled introduction of the sealed capsules into the Model 440 eliminates the problems associated with analyzing even volatile liquids. 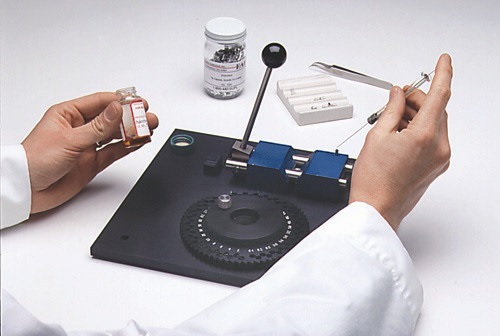 In the described method, liquid samples are simply injected into sample containers and the containers are sealed. Very volatile samples, in particular petroleum products, tend to creep once placed in containers resulting in small portions of the sample being lost. By following the Exeter Analytical procedure for handling volatile liquids, labs can now be assured of quality results. Featuring a horizontal furnace design, the Exeter Analytical Model 440, allows analysts to routinely and simply produce accurate and precise data on wide ranging liquid sample types without system re-optimisation, saving precious time and reducing running costs.